As we predicted even before Sathya Sai Baba died, a crop of Prema Sai’s would appear. There are now already several claimants to the title, and two more have recently surfaced. The one presented below is from Tamil Nadu and, as one can see, he must have been going for a couple of decades at least before proclaiming himself. 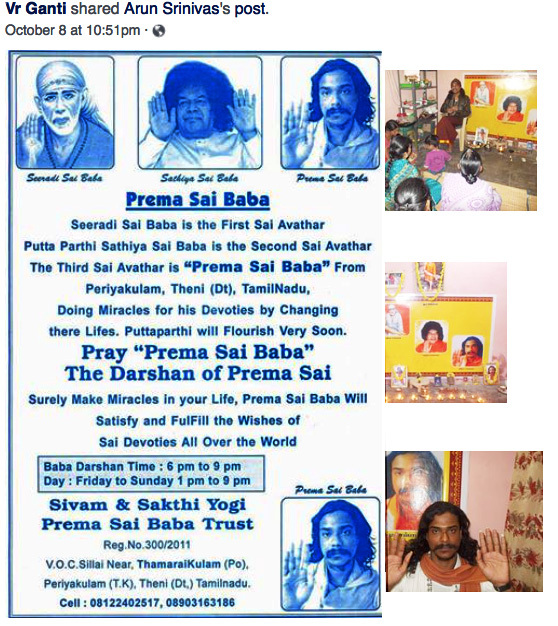 MEET SELF PROCLAIMED PREMA SAI……..ANOTHER FRAUDSTER….NO DIFFERENCE BETWEEN HIM AND MADHUSUDHAN NAIDU…..SUCH A BUFFOONS…..JOKERS……MORONS….BOTH OF THEM……BOTH USING SWAMI’S IMAGE FOR CHEATING INNOCENT DEVOTEES……NEED TO TAKE ACTION………BUT WHO ? THIS TIME ME……. Sathya Sai Baba replacements: Sukshma Sai, Prema Sai… July 30, 2015 There are several substitutes for the lost Sathya Sai Baba recognised by sections of the devotees he left behind. Prema Sai is found Posted on June 3, 2015 They are doing pujas…they are doing bhajans…they are giving arathi..They are doing ground-breaking ceremonies for a new temple, they are filled with emotion. Shirdi, Sathya and Prema Sai as one triple avatar? November 3, 2011 Sathya Sai Baba prophesied a further incarnation for himself as Prema Sai, thus to complete the task of the triple Sai Baba avatar. Lunatic Devotee claims he is Prema Sai May 4, 2008 Tje new Prema Sai has a lunatic and fanatical supporter fringe which throws up some of the most comical nutters anywhere on the web. This entry was posted on November 7, 2016 at 12:29 pm	and is filed under Sathya Sai Baba. Tagged: Prema Sai Baba, Vr Ganti. You can follow any responses to this entry through the RSS 2.0 feed. You can leave a response, or trackback from your own site.